Luckyfinds: Indulge in Dominos Pizza now! Indulge in Dominos Pizza now! 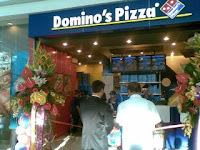 The world leader in delivering delicious, fresh and hot pizzas right at your doorstep, DOMINO’S PIZZA recently opened its fourth Philippine store at SM Center Las Pinas last September 30th. 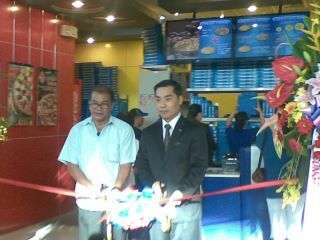 The Domino’s Pizza Las Pinas City grand opening commenced with a ribbon-cutting ceremony led by Mr. Tong Hong, President and Managing Partner of Domino’s Pizza Philippines and Las Pinas Councilor Hon. Renato P. Dumlao , followed by Fr. Gio's blessing of the store, scooters and its friendly crew. Las Pinas dwellers can now indulge in Domino’s Pizza’s best-sellers: ExtravaganZZa, MeatZZa, Double Decker, Pepperoni Feast, Hawaiian and Domino’s Deluxe flavors. For adventurous palates, the exclusive Potato Pizza and Margherita are sure to be real treats. Also a must try is the sin-free Shrimpus Pizza and satisfy your cheese cravings with Domino’s Cheese Mania. Complimenting the goodness of Domino’s Pizza’s piping hot pizzas is an exciting variety of pastas and side dishes to boot. Domino’s Pizza also serves Buffalo Chicken Wings, Meaty Bolognese Spaghetti, Creamy Alfredo Spaghetti, Cheesy Bread, and the Choco Lava Cake and Apple Crumble Dessert Pizza for your sweet tooth. All that, plus the excellent customer service that Domino’s Pizza is known for world-wide. 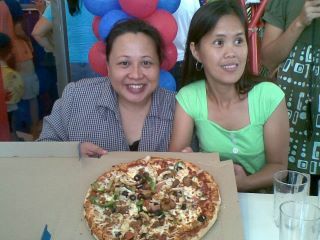 Domino’s Pizza has more than 9,000 stores in more than 65 countries with over 175,000 employees and 2,000 franchisees. As The Pizza Delivery Expert, Domino’s Pizza is the master of pizza innovations that have become the benchmark of industry standards. Domino’s Pizza introduced the fiberglass pizza box case and has made improvements on the corrugated pizza box. Domino’s Pizza exclusively uses its patented Heat Wave technology, which is the reason pizza lovers the world over get to enjoy fresh, hot, and delicious Domino’s Pizzas all the time. With the opening of Domino’s Pizza stores in Makati, Pasig, Alabang and Las Pinas this year, Domino’s Pizza Philippines now contributes to Domino’s Pizza’s worldwide sales of over 400 million pizzas each year. Domino’s Pizza Philippines aims to gain ground throughout 2011 and in the next few years to deliver to more Filipinos as part of their expansion plan. Give in to your pizza craving with Domino’s Pizza’s line up of appetizing pizzas that are sure to arrive at your doorstep in 30 minutes or less—or your pizza is FREE. Just call 576-3030 for delivery within Pasig City; call 754-3030 within Makati City; call 553 3030 within Muntinlupa City and now in Las Pinas City at 519 3030. Visit www.dominospizza.ph for the maps, current promotions, and menu of delicious, piping-hot pizzas from The Pizza Delivery Expert, Domino’s Pizza.